1. Italy ($30,756), Greece ($29,361) and Portugal ($30,756) would rank as the three poorest U.S. states, below even Mississippi in per capita GDP ($31,233); Portugal would be 26% poorer than Mississippi. 2. Spain ($31,955) would be America’s second poorest state, ranking between West Virginia ($33,978) and Mississippi ($31,233). 3. 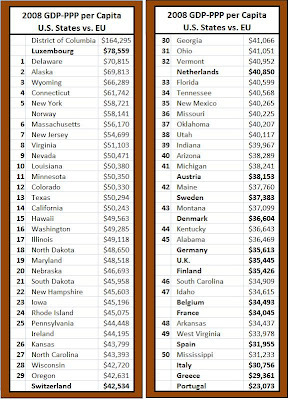 France ($34,045) and Belgium ($34,493) would rank #48 and #49 as U.S. states, just barely ahead of Arkansas ($34,437). 4. Germany ($35,613), U.K. ($35,445) and Finland ($35,426) would rank among the poorest 15% of American states, with per capita GDP below Alabama ($36,469). 5. Although Switzerland (not an EU country but included here), Netherlands, Austria, Sweden and Denmark rank among Europe's wealthiest countries, they would be below average as U.S. states measured by GDP per capita, ranging between 9.5% below the U.S. average for Switzerland to 22% below the U.S. average for Denmark. 6. Luxembourg is the only EU country that would rank above average and would in fact be the wealthiest American state, but behind the District of Columbia in per-capita GDP. Bottom Line: Professor Krugman claims that “Europe’s economic success should be obvious even without statistics.” Unfortunately for Krugman, the economic statistics tell a much different and bleaker story about Europe than Krugman portrays, and suggests that "America's economic success should be obvious - just look at the statistics." Since PPP is based on a the derived exchange rate of the comparative cost of goods in different countries, shouldn't state GDP's also be adjusted based on different costs of comparable goods? I would think that even something as simple as the McDonald Big Mac hamburger index will vary across the US. You might find that some states do better than Luxembourg, etc. and others listed above Switzerland are actually below. This comparison is misleading because you use purchasing power parity values only. Nominal GDP per capita tells a completely different story: http://en.wikipedia.org/wiki/List_of_countries_by_GDP_(nominal)_per_capita. You should at least show both PPP and nominal values. Being the habitual cheater he is, Krugman asks his readers to compare America to Paris, London and Frankfurt. "For those Americans who have visited Paris: did it look poor and backward? What about Frankfurt or London? You should always bear in mind that when the question is which to believe — official economic statistics or your own lying eyes — the eyes have it." If you stop and think about this for a second the problem becomes apparent. These are not representative cities, they are three of the absolutely richest areas of Europe! According to Eurostat, which contains GDP per capita figures for European regions, each inhabitant of London produces 65.3% more than the UK average. The figure for inner city London, the area most American visiting would see, is 279%. That is not a typo. Inner city London is the richest region in Europe. Paris has a per capita income 272% higher than the French average. Lastly Frankfurt, the financial hearth of continental Europe, has a per capita GDP 278% higher than Germany as a whole. (Stockholm earns 37% above the Swedish average, for those curious). ... Paris is rich, which our eyes would confirm. The suburbs and most of the rest of France is not. The correct comparison for Frankfurt would be Manhattan, not the US average. A meaningful question is not if 3 of the richest cities of Europe (randomly chosen by the dear professor for the benefit of his readers, no doubt) are backward, it is if typical Europeans earn less than typical Americans. Which they do, which the data confirms, and which an in-depth journey in Europe or a comparison of starting wages of various professions would verify. The lesson? Trust your eyes, just never trust Paul Krugman. Krugman uses economics for political reasons, in a dishonest way. He's better at explaining the bark on a tree than the forest. GDP per person from states with natural resource extraction. What kind of phoniness is this. Look at per person income. Do you think Louisianna should rank as high in income, Alaska...give me a break. Where's the link to your 'per person income' comparisons? I don't whine. I am not a true believer of whatever crp someone puts on the web to keep or attract true believers. If you don't know how to use US census data, I can't help you. The folly of using GDP to measure much of anything is illustrated by the District of Columbia's top ranking. This is an area that produces virtually nothing but trouble, frustration and anger. Yet the fact that it spends so damned much puts it first. The same, by the way, holds true for London and Paris. There is an error in point #1. Portugal has the same amount as Italy, and Portugal is cited as being 26% below Mississippi, but the Miss. number cited does not support that conclusion. You should read this report done in 2004. Statistics from 2000. Swedish Free Market think tank Timbro, yes there exist free marketeers in Sweden. Unfortunately the underlying book "Sweden vs USA" is not available in English. It shows exactly what will happen if the US choose the polices Sweden did in the 70's and 80's, functional socialist, instead of the neo-liberal polices enacted in the 90's that saved Sweden, solved it's banking crisis and made it the envy of all left US liberals. "If the European Union were a state in the USA it would belong to the poorest group of states. France, Italy, Great Britain and Germany have lower GDP per capita than all but four of the states in the United States. In fact, GDP per capita is lower in the vast majority of the EU-countries (EU 15) than in most of the individual American states. This puts Europeans at a level of prosperity on par with states such as Arkansas, Mississippi and West Virginia. Only the miniscule country of Luxembourg has higher per capita GDP than the average state in the USA. The results of the new study represent a grave critique of European economic policy. Stark differences become apparent when comparing official economic statistics. Europé lags behind the USA when comparing GDP per capita and GDP growth rates. The current economic debate among EU leaders lacks an understanding of the gravity of the situation in many European countries. Structural reforms of the European economy as well as far reaching welfare reforms are well overdue. The Lisbon process lacks true impetus, nor is it sufficient to improve the economic prospects of the EU. EU versus USA is written by Dr Fredrik Bergström, former president of the Swedish Research Institute of Trade, and Mr Robert Gidehag, until recently Chief Economist of the same institute and now President of the Swedish Taxpayer's Association"
You should also read the blog Super-Economy by a Swedish-Kurdish PhD student in the US. "Work and Leisure across the Atlantic"
He shows that at the same time that the leisure Krugman so admires increased so did very high marginal taxation (incl. social security taxes, fees and premiums) in Sweden in the 80's some 95 %. Tino's conclusion and I agree is that increased leisure is not a function of the increased welfare system but a function of a rational choice. My mother a government dentist as well as trade union negotiator exchanged increases in wages for more benefits in kind in general and free time and vacation in particular. None of her colleagues worked more than 7-8 months a year, she had 12 weeks paid vacation and could retire at 60, normal pension age was 65. EU vs USA, Part III is actually very damning of the US. How is it that Europe has such low GDP per capita but the quality of life is so much higher than in the US? Imagine what Europe would be like if it had a GDP per person equal to say, piddling New Jersey - now there's a superior place to live compared to say Italy or Portugal! I live in a part of rural Europe where people typically bring home 1,500 Euro PER MONTH. Yet, in every way, the quality of life, the quality of the houses, and the quality of services is in every way superior to anything in the finest US elite suburbs. For one thing, there is no suburban sprawl and all the ugliness that has ruined America. Secondly, the quality of your child's education does not depend on which town you live in. Education is a nationally administered system. Mass transit is plentiful and cheap, thanks to the $4.50 per gallon gasoline tax. I know "mass transit" and "gas tax" send shivers down the spines of readers of this blog. Finally, why is it that America is so rich yet lives so poorly and disgracefully? I have lived some years in both the US and Germany. The interesting thing about the statistics showing lower GDP per capita in Europe is not how much richer the US is, but how much better life in Europe is, given their reduced wealth! Looks like I'm a little late to the party having gotten here via a link from BusinessInsider about income inequality. The chart used here is so misleading but completely representative of American thinking. Bigger is better. What To Do If Scott Brown Wins in MASS on Tues.